Cams Hill School Art department is an exciting hub for creatives where pupils are supported to develop their ideas and imagination through excellent after-school learning experiences. Our dynamic Art Department offers Lower school Art and Photography clubs and runs regular after-school sessions for KS4 students. The department actively encourages pupils to get involved behind the scenes in whole school collaborative events such as school productions, concerts and imminently, the Rock Challenge. Our annual Camscreative art competition invites all members of the school, staff and pupils alike, to get involved with a variety of categories and prizes on offer. You can find us on Twitter and Instagram. We believe social media can have a positive impact on celebrating success of our pupils as well as sharing good practice. 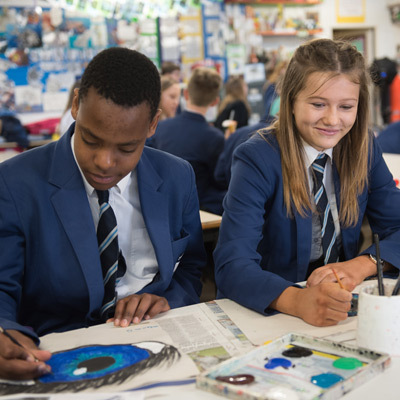 The creative arts are an integral part of life at Cams Hill and have been proven to help develop key skills that are essential across the curriculum and that are essential in all walks of life. We encourage any pupil who is interested in the creative arts to engage in the opportunities on offer.